On Sunday, Jan. 31, famed violinist Midori held an all-day workshop in anticipation of her concert next Saturday, Feb. 6 at Herbst Theater. The symposium included panels and a master class, and started with a lecture/demonstration, a collaboration between Midori and SF Performances regular Robert Greenberg. At 10 a.m. in the main theater of the SF Conservatory of Music, Greenberg was in rare form, using a blend of erudition and flailing adjectives to explicate the upcoming “Music of Her Time,” a program of five very different works composed during Midori’s lifetime. The violinist followed his lead with sneak peaks at each work. Greenberg spoke of global influences in modern music, and of how each of these five composers has a unique sound and school of thought. Referring to overly technical program notes—and his own prefatory flourishes—he adjured us not to “throw the informational baby out with the rhetorical bath water.” His comments were indeed pithy and illuminating. Huw Watkins wrote Coruscation and Reflection in 1998 at the age of 22. This young Welshman was conservative in his material but idiosyncratic in its use: pentatonic scales and well-used chords gave rise to unfamiliar clusters, what Greenberg described as post-modern wattle and daub. He went on to describe Coruscation as “fast, sharply etched lines in the violin, with ringing piano,” and the following Reflection as “ruminative, lyric, and not infrequently passionate.” And indeed, Midori’s version was both thoughtful and mirror-like. The violin’s slow notes turned the point of each moment into a plane with a surface like water. Notes echoed in blurred reflections, and sank with a malleability that spoke to a thick and plastic present. Violin semi-tones were connected by the piano into long strands of chromaticism, which transformed again into luscious tone clusters. The five movements created an arch, with the Adagio as keystone, an oasis of longing in the center. Midori performed that movement with grace and a seamless slide into and out of harmonics. Then she gave us a sample of the fourth movement Totentanz, a fevered waltz of Death. Toshio Hosokawa’s deeply inward Vertical Time Study III, John Adams’ energetic and subtle minimalism, and James MacMillan’s sensual After the Tryst gave us three more original directions for contemporary music. After the lecture/demonstration Midori went on to give a master class for four Bay Area violinists who had each prepared one of the works on Midori’s program, and it was a satisfying glimpse into rarefied nuts and bolts. “The piece doesn’t change with the facts,” Midori answered tartly. And the Hosokawa was a case in point. While not melodic enough to be “hummable,” its textures were riveting. 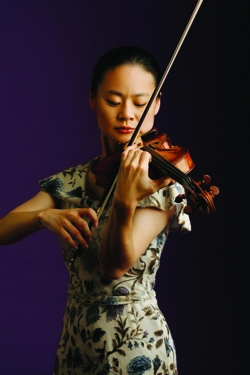 Midori returns to San Francisco’s Herbst Theatre on Saturday, Feb. 6 at 8 p.m. for the full concert. Tickets and information are available at www.performances.org or 415-392-2545.